LIMA, Feb 29 2012 (IPS) - The Onda Rural communication for development initiative in Peru has come up with a range of strategies to get information out to remote villages, to help them with decision-making on questions like climate change adaptation or disaster preparedness. “Neither radio nor television will change the way of thinking or the traditional way of life in highlands communities,” Carlos Rivadeneyra, the World Association of Community Radio Broadcasters’ (AMARC) representative in Peru, told IPS. Since 2004, AMARC, the Latin American Association for Radio Education (ALER) and the Food and Agriculture Organisation (FAO) have been carrying out activities in several countries of Latin America that include communication for rural development and policy-making – in particular the Onda Rural communication for development project. In Peru, the work has been carried out mainly through radio programmes in three southern highlands regions, Puno, Cuzco and Arequipa, usually as part of FAO projects involving agricultural activities in emergency situations, like floods, freezing weather, or drought. “Our contribution is aimed at connecting issues that are important for these communities with different radio networks in the country,” Rivadeneyra said. The programmes are broadcast in Spanish, as well as Quechua and Aymara, the two indigenous languages spoken in Peru’s highlands communities, located 3,400 metres above sea level and higher. The activities are focused on the production of short radio programmes in which local peasant farmers talk about weather events and experts explain why they occur and what can be done to prepare for and deal with each specific emergency situation. Workshops for journalists and radio producers are also held, to promote the inclusion of these issues in radio programming. AMARC and ALER have also organised workshops on climate change and environmental protection in the same regions, where they have formed a network of allies. Claudio Orós, producer of the Sisichakunaq Pukllaynin radio programme – the name means “game of the ants” in Quechua – that is broadcast by 12 stations in Cuzco, told IPS that one of the most important aspects of the workshops is the sharing of experiences with colleagues from other towns and regions, which helps to make it possible to respond better to the needs of rural communities. The programme addresses the question of protecting the environment by keeping traditional knowledge and customs alive. And the target audience is primary school children. Produced by Orós’s Pukllasunchis Association, the 15-minute programmes are used as a teaching tool for teachers in rural schools in the district of Lares, in Cuzco region. Like a story-teller, the narrator describes different situations faced by local communities, speaking in both Quechua and Spanish. “The people of Quishuarani believe the ancient Inca still live on in the oldest ‘quiwuña’ (Polylepis) trees in the community. These trees are taller and thicker and are respected by everyone,” the radio announcer says, describing the beliefs of the community and their respect for nature. Quishuarani is a village in Lares that basically depends on agriculture and is located along an Inca trail in an area with a large variety of wild trees. Local native traditions are very much alive in the community. 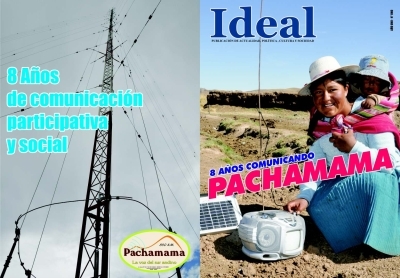 The local radio station coverage of these issues promoted by Onda Rural has used different approaches and styles. In the city of Puno, Juan Sotomayor, the administrator of the Pachamama (mother earth) 850 AM radio station, said the training workshops have enabled the station’s team of journalists to become familiar with new technological tools and formats, and especially to adapt local questions to social and political contexts of a national scope. Sotomayor said the radio station, which also broadcasts online, reaches the entire region, and 80 percent of its programming has an educational focus and is tailored for rural audiences. Although the impact of these communication strategies has not been assessed, the organisations behind Onda Rural and the journalists involved say the local population is increasingly interested in the programmes, and is keen on participating. But the effort has also run into obstacles. Rivadeneyra said several activities have come to an end because the projects “are limited and have a modest budget. “The state should support this kind of initiative, but it regrettably has weak participation in communication for development, and even more so in the areas of agriculture and the environment,” he said. For that very reason, the project for an early warning system for weather events developed in highlands towns in Arequipa, Cuzco and Puno came to an end in spite of its impact and innovativeness. Communication played a key role in that initiative: local residents trained to read the data from the weather stations set up in their villages relayed the information to the government’s national meteorology and hydrology service. The national meteorology and hydrology service in turn processed the data and placed it on a special web page available to radio stations, which used it to produce early warning messages. Unfortunately, the project ended in April 2009, Rivadeneyra said. Mori explained that FAO funds have an end date, because they are principally related to emergencies. But he also said that since 2010, the United Nations agency has been working to link these initiatives with development projects that the local authorities can take control of. While these challenges are tackled, the organisations have new projects up their sleeves. FAO is working on a national agricultural risk management and climate change adaptation plan that will have to be disseminated among the communities, while AMARC is involved in the production of radio programmes to help indigenous people in the Amazon region of Ucayali deal better with floods.